of the halls of Khazad-dûm? with words of thrumming power. So much effort for so little! for a project worthy of Fëanor himself. glow as if moonlight shimmered on water. Asks a smelter-singer, with a respectful bow. above the dwarrowdelf, and he smiles. Wendy S. Delmater is a writer, poet, and the long-time editor of Hugo-nominated Abyss & Apex Magazine. Recent publication credits include short stories and poetry in *Star Line*, Silver Blade, The Singularity magazine, and Illumen. Her new poetry chapbook Plant a Garden Around Your Life can be found on Amazon. Authors’ Notes: J.R.R. Tolkien drew heavily on Nordic myths in his mythology of elves. So it felt fitting to have a Nordic translation of an origins story for the Doors of Mordor from the happier time when Hollin (Eregion, in elvish) was under the dominion of the high elves who had come from Elvenhome to Middle Earth. The linguistic challenge of writing this poem in a similar style to Tolkien’s verse while staying within the confines of Norwegian, which has very few words, were considerable, but we believe that the results are worth it. med ord av trommende styrke. Så mye kraft for så lite! for et prosjekt verdig selveste Fëanor. glødende som månelysets skimmer på vann. Spør en smelter sanger med et respektfullt bukk. Editor’s Notes: Ithildin was a substance made by the Elves out of the metal mithril and used by the Gwaith-i-Mírdain in constructions such as gateways. Ithildin could only be seen by the reflected light of the Moon and stars, and even then remained hidden until a “magic” word was said. The designs on the Doors of Durin were made from this substance. In the legendarium, Gandalf translated ithildin as “starmoon”. Tolkien stated that ithildin is a Sindarin name, meaning “moon-star(light)”, “moonlight” or “starlight.” The word contains the elements Ithil (“moon”) + tin/tîn (“spark; star; twinkle of stars”). He noted that the correct Sindarin form should be ithildim . 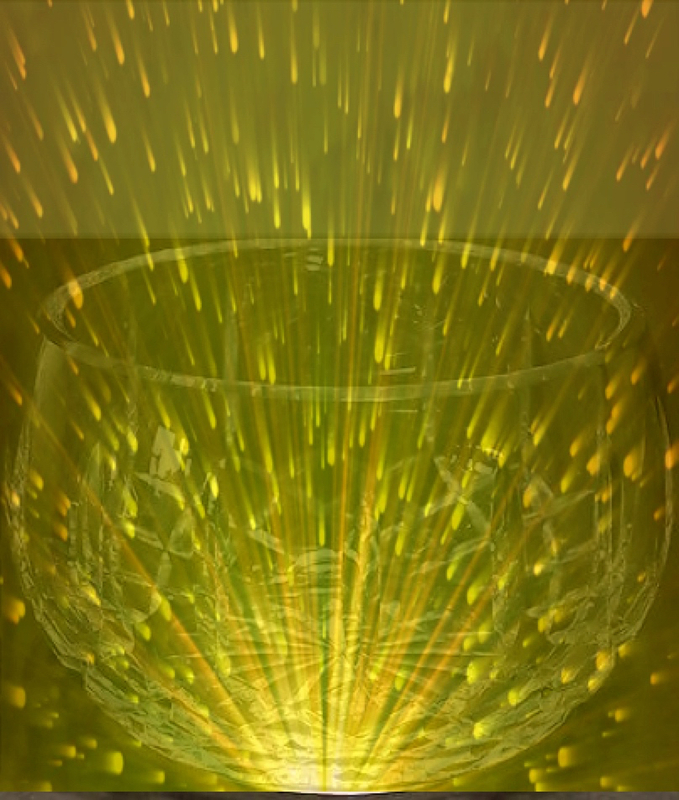 The composite image was stimulated by the line, “bowl to shine like stars”: a crystal bowl superimposed with an abstract radiant light source.